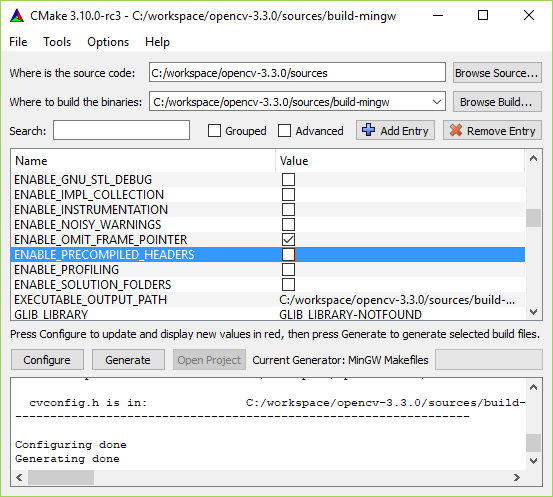 on windows 10 (64 bit), with CMake 3.13.1 and Mingw-w64 - GCC for Windows 64 & 32 bits. Mingw-w64 could be found following http://mingw-w64.org/doku.php/download. From that page, click on download "Win-builds" that will bring you to the page http://mingw-w64.org/doku.php/download/win-builds from where you can access to http://win-builds.org/doku.php/download_and_installation_from_windows. Here simply download and run the package manager, in our case we downloaded win-builds-1.5.0.exe file. Once downloaded, double click on the the exe file. It will open an installation window. A window shows the progression of the installation. When all the packages are installed you can close all the installation windows. Modify the Path var to add %VISP_WS%\visp-build-mingw\install\x64\mingw\bin corresponding to the path to ViSP libraries. ViSP is interfaced with several 3rd party libraries. The complete list is provided here. We recommend to install OpenCV 3rd party in the workspace. OpenCV 4.0.0 win pack installer contains prebuild OpenCV libraries build with Visual Studio 14 2015 Win64 (vc14) and Visual Studio 15 2017 Win64 (vc15) but there is no build for MinGW. That's why you need to build yourself OpenCV from source and install the libraries in %VISP_WS%\opencv-4.0.0\build\x64\mingw. 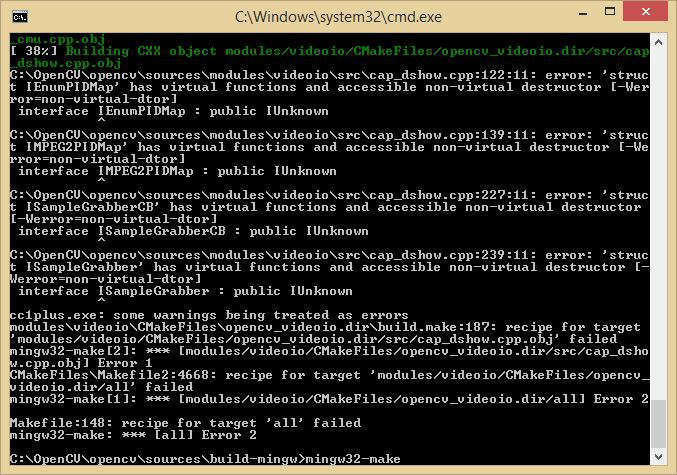 Modify the Path var to add %VISP_WS%\opencv-4.0.0\build\x64\mingw\bin corresponding to the path to OpenCV libraries. Depending on OpenCV version you may encounter the following issues, for which we propose work arrounds; windres.exe invalid option --W, Build error in cap_dshow.cpp, OpenCV build error: struct has virtual functions and accessible non-virtual destructor, OpenCV build error: cannot build with tiff support, or OpenCV link error: cannot find -lRunTmChk. You have also to add the location of OpenCV libraries corresponding to MinGW usage in the Path environment variable. Open the "Edit environment variable" UI, and modify Path to add a new line with %VISP_WS%\opencv-4.0.0\build\x64\mingw\bin. 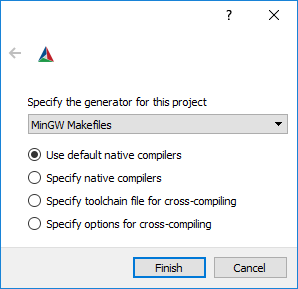 The goal of the configuration step is now to use CMake to produce a Visual Studio C++ solution file that will be located in %VISP_WS%/visp-build-mingw. 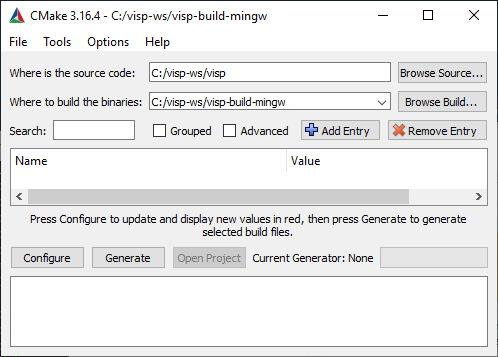 Click on "Yes" to create the %VISP_WS%/visp-build-mingw folder. Select then your compiler "MinGW Makefiles" and click on "Finish" button. This will start CMake configuration. As shown in the next image, OpenCV, GDI (Graphical Device Interface), libjpeg, libpng and pthread 3rd party are automatically detected. 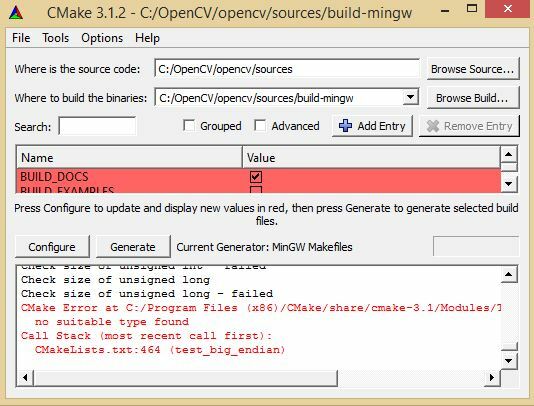 If OpenCV is not detected, you may encounter the following issue OpenCV not detected with Mingw build. Installation folder is set to %VISP_WS%/visp-build-mingw/install. If you want to change the installation folder to C:/Program Files (x86)/ViSP, make sure that you have administrator privileges to write in that folder before modifying CMAKE_INSTALL_PREFIX. Once the generation is done, in %VISP_WS%/visp-build-mingw folder you have the Makefile file that will be used by MinGW to build the whole project. 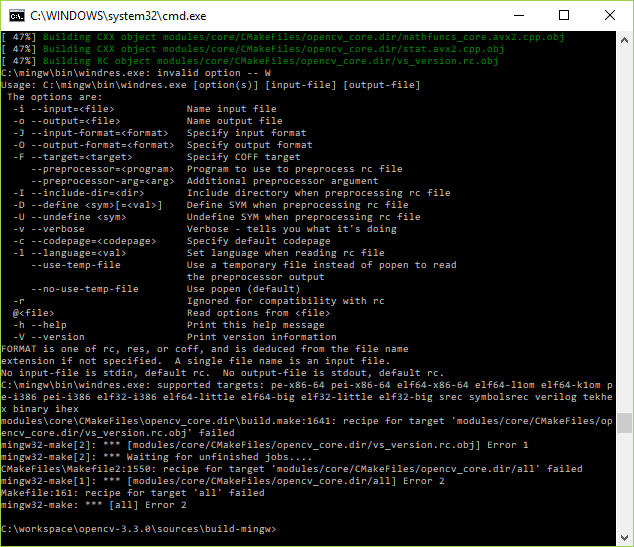 At the end, in %VISP_WS%/visp-build-mingw/install/x64/mingw/bin folder you will find ViSP DLL libraries corresponding to the build modules. When CMAKE_BUILD_TYPE is set to Debug, the library names are suffixed by "d". Modify the Path var to add the path to ViSP dll libraries. To this end open the "Edit environment variable" UI, and modify Path to add a new line with %VISP_WS%\visp-build-mingw\install\x64\mingw\bin. This issue occurs with OpenCV 2.4.10, 2.3.0-beta and 2.3.0 releases. Click on "Configure" button, and then on "Generate" one. This issue occurs with OpenCV 2.3.0-beta and 2.3.0 releases. A work arround is to configure OpenCV without ipp support turning WITH_IPP=OFF and then trying to build again. 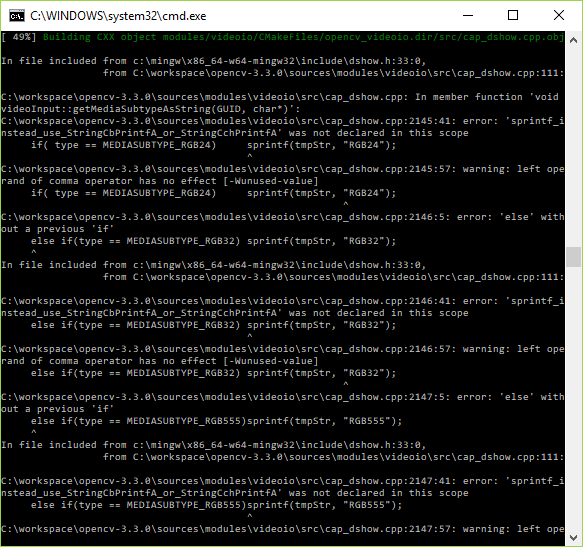 This error that occurs with OpenCV 3.0.0 during cap_dshow.cpp build is known and reported as an issue in https://github.com/Itseez/opencv/pull/5282/commits. #pragma GCC diagnostic ignored "-Wnon-virtual-dtor"
This issue occurs with OpenCV 2.4.9, 2.4.10 and 2.3.0-beta. This issue occurs with OpenCV 3.3.0.